Every spring lemon, berry and cupcakes start filling the internet and I’ll be honest with you. I’m totally a fan. Especially of the lemon and berry desserts. Is there really any better combination? Well, maybe chocolate and berries, especially raspberries. I wanted to mix things up a little bit this spring so I started experimenting with chocolate and Quaker Oats Steel Cut Quick 3-Minute Oats . I know, not where you thought I was taking this right, but working with Quaker totally sparked a flame in me for a world’s best chocolate oat hot fudge cake and I just had to test it out. And before I forget, make sure you scroll to the bottom to enter a giveaway for a Quaker gift pack including: set of two (2)oversized ceramic oatmeal mugs, one (1) one-pocket apron ideal for cooking and baking, a set of four (4) red ceramic measuring cups, one (1) all-purpose wooden spoon, one (1) retro kitchen timer, one (1) $25 Visa gift card to purchase ingredients for your steel cut oat creation, one (1) spacious wicker basket, one (1) Quick 3-Minute Steel Cut Oats Canister, one (1) Quick 3-Minute Steel Cut Oatmeal Blueberries & Cranberries and one (1) Quick 3-Minute Steel Cut Oatmeal Brown Sugar & Cinnamon flavors. Total giveaway value is approximately $130! You see, I don’t think that chocolate needs to disappear when the weather starts warming up. In fact, Cade votes for chocolate all year round and who can really argue with that? I love an old fashioned oatmeal cake but I wanted to make an apple version (don’t worry, it’s coming I just have to work on the recipe more) and immediately Cade said, but doesn’t chocolate sound more fun? Oh gosh, of course it sounds fun! I’m such a fruit addict though, I could not help but toss a few sweet raspberries in with everything and you know what? It was way better than normal! I’ve had issues with steel cut oats for a while. I love them. They fill me up more than other breakfasts and in a good way, but they take forever to make! 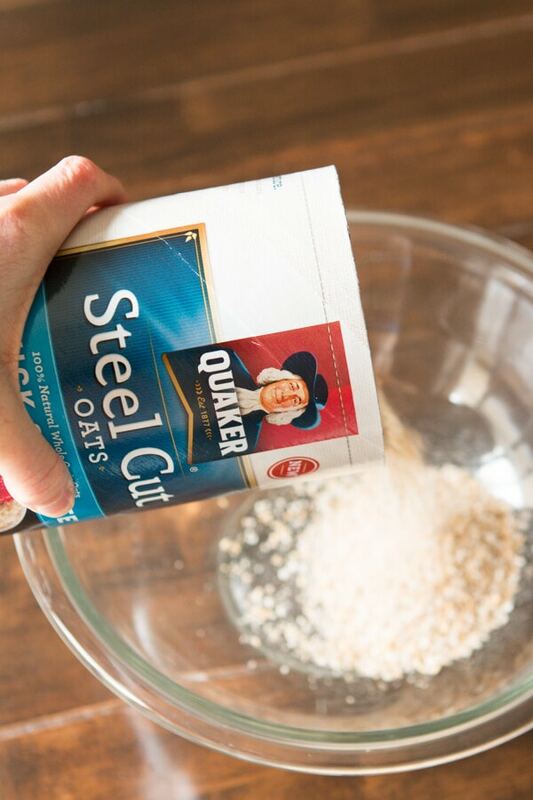 I was so thrilled to find out Quaker has quick steel cut oats now made from 100% whole grains that are expertly cut to preserve texture. Plus, they’ve got individual servings in different flavors. Booyah! Don’t be afraid of this recipe and the part about sprinkling the cocoa on top and pouring hot water on that. I promise it’s normal and what will make that pudding bottom. And those steel cut oats? Don’t worry they cook up into little bits that everyone was convinced were pieces of toffee! HA! I love that! But do not get fooled, this is not your normal cake, but more like a pudding cake with a fudge bottom so don’t overbake it. Our girls had so much fun making this recipe. They were so worried about those steel cut oats at first, but as you can see, the moment I finished photographing and started cleaning up I had a little one sneak over and start devouring the whole thing. And just like any good mom I had to capture the moment because heaven knows these kids are growing up way too fast. Non-contaminated, pure oats are gluten-free. Contamination can occur when oats are processed in a facility that also processes wheat products. Always read the label to be safe. Oats are some of the healthiest grains on earth. Oats and oatmeal have many health benefits. Oats can help with weight loss, lower blood sugar levels and a reduced risk of heart disease. Will Chocolate Cake Cause Heartburn? 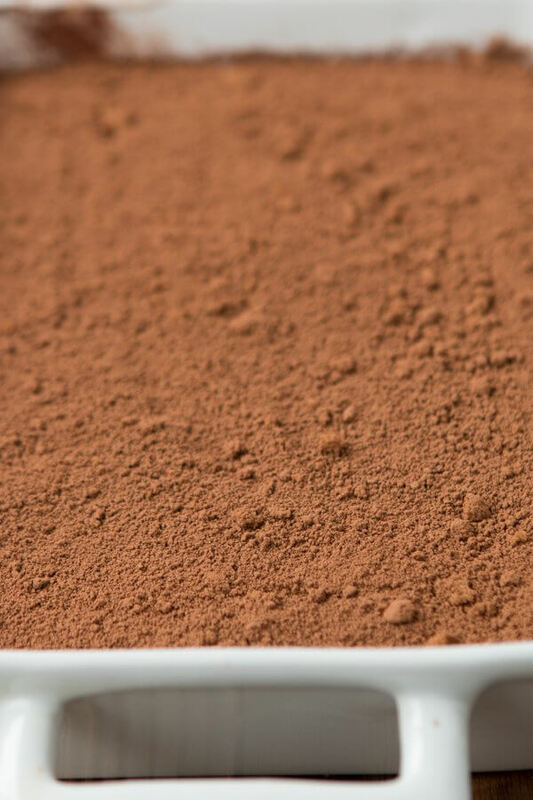 The cocoa powder in chocolate is acidic and could cause heart burn or acid reflux in individuals that suffer from these conditions. Spray a 9×13″ Baking pan with cooking spray and heat the oven to 350 degrees. In a glass measuring cup, combine the buttermilk and water and heat in the microwave until hot but not boiling. Pour into a large bowl and add the steel cut oats, stirring to combine. Allow to sit for 20 minutes. In the bowl of a standing mixer, mix the oil, butter, sugar and brown sugar together. In a separate bowl, combine the flour, baking soda, baking powder, salt and cocoa. Whisk to combine and add to the egg mixture. This should make a very thick batter. Once the oats are soft and have absorbed some of the liquid, mix it into the batter (water and oats). Add the chocolate chips and mix then pour into a baking dish. In a small bowl, combine the brown sugar and cocoa and sprinkle on top of the cake batter. Boil the water and pour over the top of the cake. Bake the entire cake for 45 minutes and serve with fresh whipped cream and berries while still hot. I like to make oatmeal cookies. Who doesn’t love no bake cookies! I put oatmeal in everything from meatloaf to cookies! One of my favorites though is the crispy oatmeal on top of a fruit crisp! My favorite oatmeal recipe is no bake cookies. 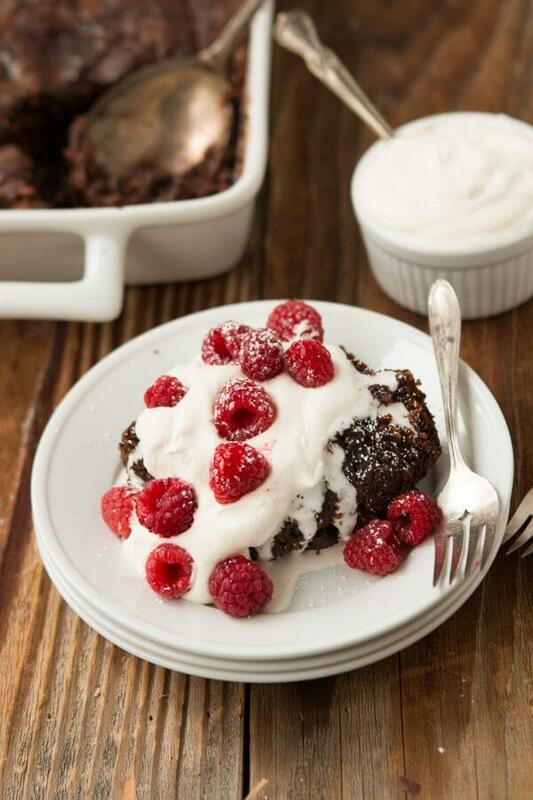 I have been making hot fudge pudding cake since I started using an oven – it’s my one weakness. I have never thought of adding anything to it, so to me you are a genius! I can’t believe they made us steel cut oat in quick cook variety! How did they do it? I look forward to trying them with apples and dried cherries. I also look forward to feeding them to the turkeys which randomly roam our neighborhood. They are not wild turkeys, they’re gorgeous turkeys who must have a home somewhere nearby – but they get loose and thrill our neighborhood a couple of times a year. They love steel cut oats! No way! That’s so fun to see those turkeys running around! I love making oatmeal cookies using golden raisins; they have a milder taste (not as sharp as dark ones). I would make no-bake oatmeal & banana cookies. I love overnight blueberry and almond oatmeal. I love oatmeal chocolate chip cookies. Before I combine the ingredients I put the oatmeal in a food processor to grind it down. I love to make my own granola bars using oatmeal and chocolate chips. I love old-fashioned iced oatmeal cookies. 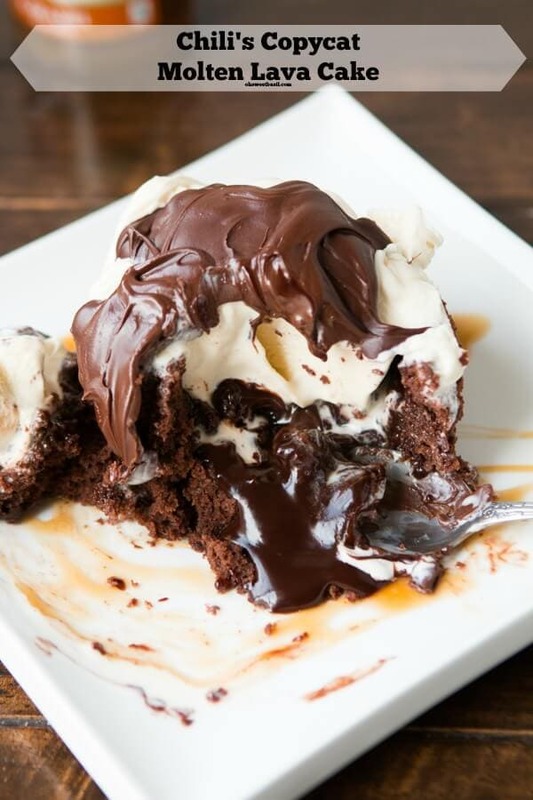 What a wonderful hot fudge cake! I love that you added oats too! I bake with oatmeal a lot. I make oatmeal cookies and also add it to cake and muffin recipes. This cake look so delicious! 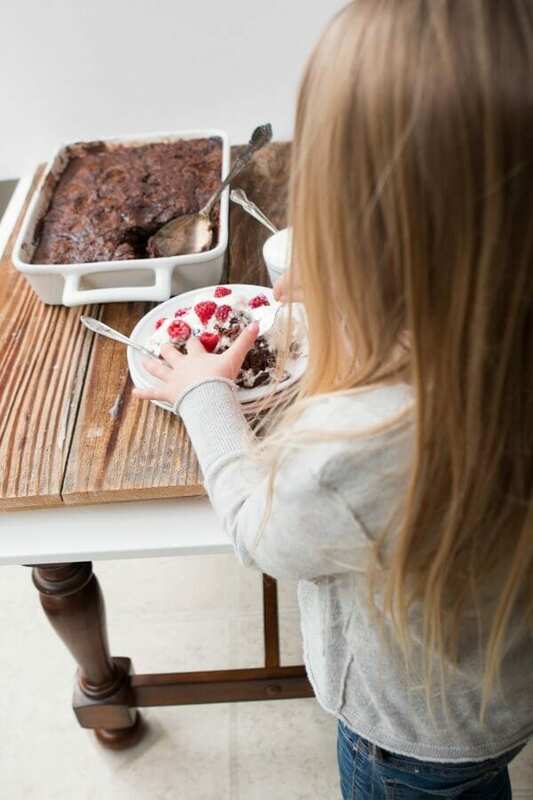 It’s a fantastic use of oats and all those raspberries on top go perfectly with the rich chocolate flavor. 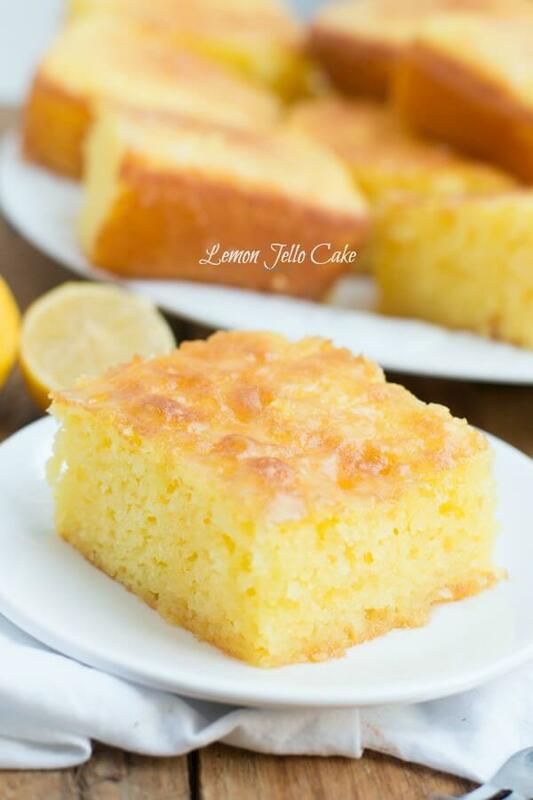 I do love all the fruity and lemon treats that start popping up this time of year too. But my heart and tastebuds go for the chocolate every single time. I definitely can’t wait to try these quick cooking steel cut oats because we love adding oats to everything!!! And this cake? Seriously I am dying over here! 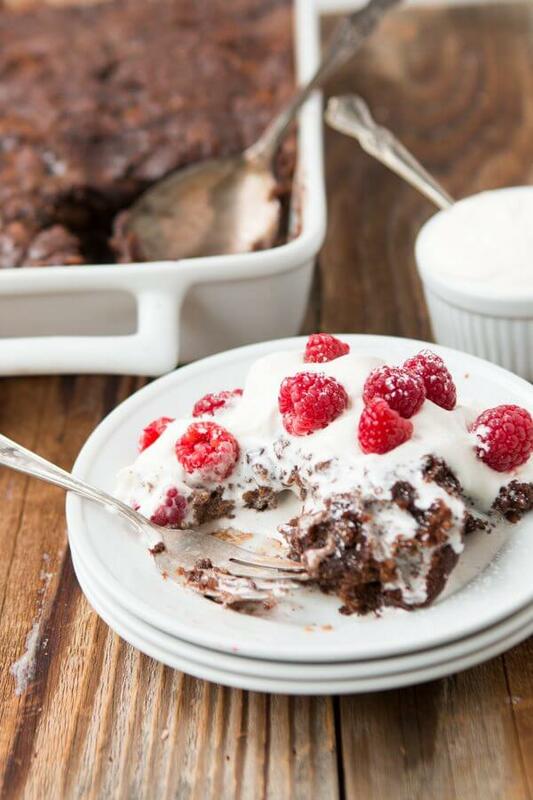 You had me at fudge…and then the raspberries and cream on top put me over the edge! I must try this! This looks amazing! Love that you used steel cut oats — cannot wait to try this! Cook it overnight in a crockpot! All the cakes look great! Definitely buying some of the steel cut oatmeal. It’s best in a chocolate chip cookie. I love steel cut overnight oats w/cinnamon, apple, craisins and pecans. But now I think I need to try steel cut oats in cake! I keep it simple – either a touch of brown sugar or cinnamon and vanilla in my oatmeal! Such a perfect breakfast or snack throughout the day. I love putting cinnamon and vanilla in my oatmeal! 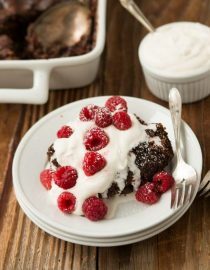 I’m up for year-round chocolate, especially if it means a scoop of this fudgy beyond belief cake! YUM. I usually enjoy my oatmeal plain with some cocoa powder and flaxseed, but this looks much, much tastier! 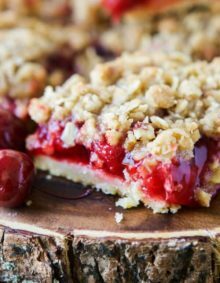 I never thought of using oatmeal in a cake, great idea! I use oatmeal for cookies and bread. Oh this looks so yummy! Thanks Carrian I never used oats in a cake. I love mixing oats into pancakes to make them heartier. I really like to use oatmeal for Flapjacks. Oh man, does this look heavenly, Carrian! Oatmeal cakes and cookies are my downfall! I’m thinking this will be perfect for Easter! Thanks so much for the great recipe! Oats are my favorite! Definitely will try them:) Chocolaty and full of flavor , looks so tasty! 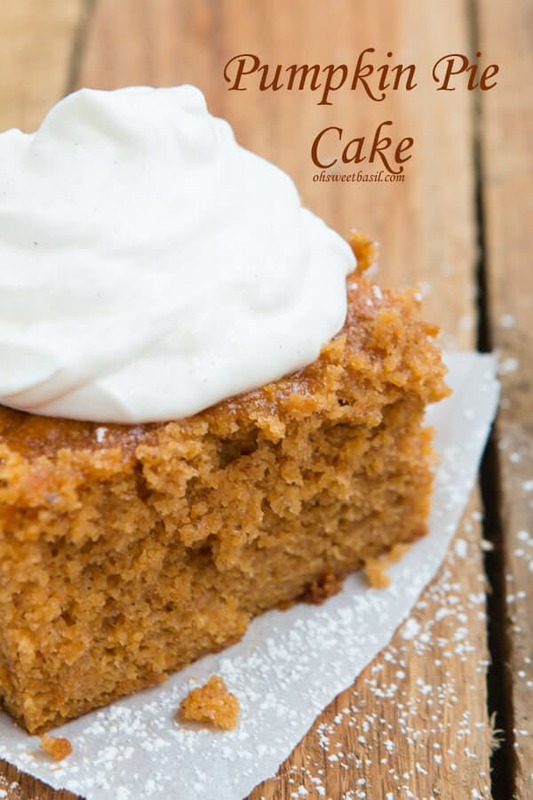 This cake looks delicious, what a great way to use oats! I’m gonna go ahead and say that no, there is no better combination than lemon + berries, but I might be biased. Nonetheless, I could quick that combo a quick break this spring for THIS cake. And this cake only! I love oatmeal in apple crisp! 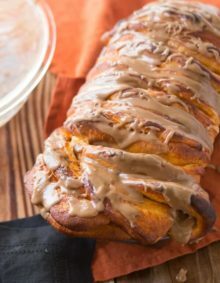 So my oldest is obsessed with baking AND oats so I am saving this recipe for our next baking adventure!! I use oatmeal in cookie recipes. I like to use oatmeal as a crunchy topping on muffins. I love Steel Cut Oats and use oats in my Raisin Oatmeal Cookies, and my healthy oat bars I make! My favorite cookies are oatmeal cookies! I use oatmeal as a breading for chicken breasts. I’ve never tried baking with steel cut oats, since these are quick cooking I assume they’re not as hard as traditional steel cut oats so I think I’d give them a try in a granola bar or cookie. That cake looks delicious, I think I’ll give it a try! 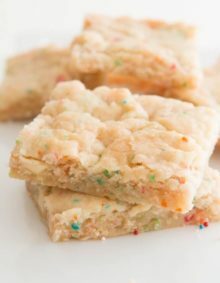 Ohhh, I love the granola bar idea! 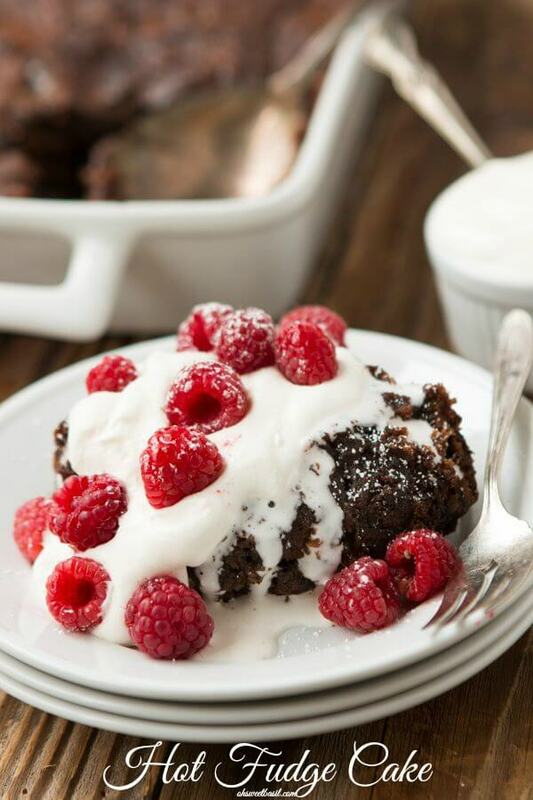 I can’t get my mind off some savory oats with a poached egg on top….but this cake looks amazing too!